I hate when I get out of the habit of writing. I feel life’s pointless; I feel I will never catch the momentum of my creative life again. It’s like the train is idling in the station and I have to run and catch it. This has happened a million times when I drove down from Lake Champlain to Albany-Rensselaer. I had to run to catch the train, back to the city, back to work. Once I missed the train and I was so pissed. Couldn’t they have radioed down to tell the conductor, “Wait one minute!” I watched the train pull away. I digress. I was writing about writing. And how hard it is to write. I have been preoccupied with winding down from my day job; vacating up in the Adirondacks; teaching my first boot camp workshop; caring for kids, spouse, family; trying to get my freelance biz going; and now organizing the Adirondack Memoir Retreat (Oct. 25-28 – Please come). The point of my life is to make stuff. There’s no good reason to blog because it doesn’t make any money. And why do anything but make a buck? our capitalist society asks. Yet our souls hunger for art. Our lives need to make things of beauty or else it’s all for nothing. It’s all spent grasping for the stupid gold ring on the merry-go-round. And you can never grasp it. You can never have enough. Money does not satisfy. Art satisfies. Creativity gives back. Handmade dinners, crafts, and poems thank you. If they don’t, well, then you have something to write about then too. Write about the disappointment and the tragedy of all that lack of return on your investment. Most of the time, you get the return, you catch the train. The conductor waits. I have caught the train more times than I have missed it. I hopped on. I watched the cities roll by my window. I opened my laptop. I caught my breath from the run to the train and started writing. This picture has nothing to do with this post. But yesterday I went to the Staten Island Yankees game. 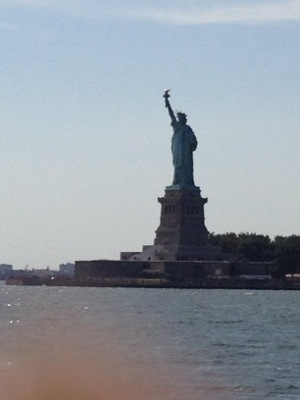 On the free ferry, you pass Lady Liberty. You are free and at liberty to pursue your happiness. usability and appearance. I must say that you’ve done a amazing job with this. when I have timje I will be back to read a great deal more, Please do keep up the great job. Wonderful post but I was wanting to know if yoou could write a littee more on this topic?